This leasing and management form is designed for an upscale marina project that also has retail and office space components. 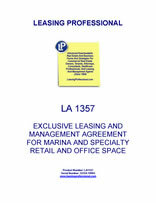 The manager has broad responsibilities under the agreement, including leasing the various types of space in the development, implementation of the leasing guidelines established by the landlord, preparation of leases, including the leases for the docks in the marina, and enforcing the terms of the leases in place for the development. The manager is an independent contractor under the agreement. The manager is required to hire employees for the management of the project, negotiate service and construction contracts for the marina development, coordinate tenant improvement activities, and maintain records for the development.